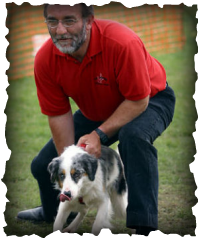 The Fylde Coasters Flyball Team was set up in 1996 by Les Chapman, a mobile dog trainer. He attended many courses on how to start and train Flyball. After making the jumps and buying his very first Flyball box (which we call the agricultural box that we train and introduce new dogs to) and rolls of netting for outdoor use and rubber matting for indoor practice, he got together a small team. The team consisted of collies and a whippet. The dogs had been doing well in training and the time had come to enter a competition. Having never entered a competition before, Les and the team didn't know what to expect or even how to go about racing. The venue was Nostell Priory 17th July 1999 and what an experience it was to be. So many noises, dogs barking, teams everywhere all in uniforms with their team names and individual logos. Dogs in matching harnesses all lined up ready to race, the excitement and intensity as the top teams performed. In the early days the teams dogs could be relied on to run in any lane but their own..! The time of 24.73 seconds was good considering neither manager nor team had every raced before. A lot of help and support was given to the team in the beginning from other more experienced flyballers. A lot has happened since the very start of the Fylde Coasters and the team has evolved. The original team split on 5th November 2000 and made another local team called the Blackpool Super Novas, Les saw this as a positive move and another team was formed still under the Fylde Coasters. 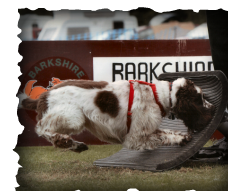 We learnt from the previous team and went from strength to strength not only did we have 1 team but 4 teams including a multi breed team which consisted of a Collie, a Springer Spaniel, a Labrador and a cross breed. We trained and competed hard and dropped the time down to 19.77 seconds losing almost 5 seconds since the Fylde Coasters was originally set up. We had two exciting years with this team competing all over the country enjoying the ups and downs of winning and losing and generally taking part. From luxury hotels (ok maybe not the Ritz or the Hilton but still nice and warm with hot running water and a loo..!) to camping in all sorts of weird and wonderful places. Eating in pubs and the famous Little Chefs up and down the motorways, or sometimes having barbeques in the dark..! At the end of the summer season of 2002 we saw some great results, including Multi Breed team of the year. 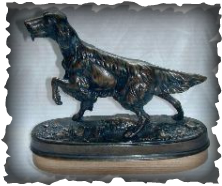 The points mounted up and the dogs gained a variety of awards. Jed was awarded first place in best Springer Spaniel as well as second place in dog of the year. TJ was awarded second place in best Labrador. Bob was awarded third place in dog of the year. Again the team evolving all the time and another split was made in October 2002, taking 7 members and their dogs to create another local all collie team called the Red Rose Rockets. The 2003 season saw the Fylde Pick N Mix team win the John Beswick Multi Breed Trophy. It was a big shock when the results were read out at the Anglesey competition in July 2003 as we had been awarded first place. This was a great honour for us to receive the trophy in it's final year of a three year sponsorship by John Beswick. Anglesey was a great weekend as not only did we win the trophy but we scooped four firsts in the same weekend, two sanctioned and two multi breed. During this year Maddy has received Flyball dog, Intermediate and Graduate for 200, 1,000 and 3,000 points respectively. Boogie achieved Flyball dog for 200 points. Quincy gained his Intermediate for 1,000 points. Emerys gained his Graduate for 3,000 points. Emma received her Advanced award for 5,000 points. TJ, Holly and Jed gained their Silver awards for 10,000 points. 2004 where has it gone! I must be getting old (no comments on that!) Well 2004 was an excellent year for recruiting new members, not only to train but also to compete in our starter teams. Notice I said the word teams as we had the Fylde Hot Dogs and the Fylde Donkeys competing in several starter competitions throughout the season. Both the Fylde Coasters and the Fylde Surfers teams did extremely well. With the repositioning of dogs and tighter passing the teams got some great times. The Coasters with only 4 dogs, with a fastest time of 20.62 and the Surfers with 6 multibreed dogs, with a fastest time of 22.15. During the year a number of awards were gained by our dogs from Flyball dog 200 points up to Gold award of 15,000 points. What a year 2005 has been, so much has happened. Remember the new starters I told you about in 2004? Well some are doing well in starters and some have progressed to make our 3rd sanctioned team the Fylde Rollercoasters, who over the year got a fastest time of 22.77 not bad for their first year in Flyball. Now the famous Surfers also had fun during 2005 keeping up tradition of an all multibreed team gaining their fastest time of 22.61 at the Summer Championships and coming a fabulous 2nd place. The Coasters eventually reached the dizzy heights of division 1 after a lot of hard work. Being in division 1 certainly pushed the Coasters to their limits with our fastest time of 20.06. Multibreed saw us put 2 teams together in the same division! Running dogs from the same family, racing in opposite lanes in different teams. We certainly had fun. The end of a very successful year for all the Fylde Coasters saw our founder and team captain Les Chapman leave the team and sunny Blackpool! For the sunnier climes of the Costa Blanca in Spain. All the Fylde Coasters wish Les all the best for the future. In 2006 I was just finding my feet as the new team captain of the Fylde Coasters. Not an easy role to step into after Les had done such a good job, but I do like a challenge. The team have been great and extremely supportive as I adjusted to my new role. So much to do and organise never mind the decisions to be made. Mind you on my head be it, if it all went pear shaped and not being completely perfect I made the odd judgement of error. Yet survived to tell the tale and do it all again the next weekend. You can never really follow on in someone's footsteps as we all have our own way of dealing with situations and how we would tackle and run things. 2006 has been a real learning curve and training and teams have had a re-jig and I feel have produced some great results. What can I say but 2007 has already been a fantastic year for the team with numerous wins for all our teams. The cream of the crop has to be at the 2007 European Championships when we took 3 sanctioned teams. 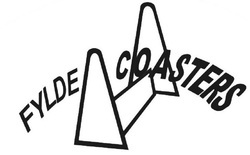 The Fylde Coasters Division 8 winners, Fylde Rollercoasters 2nd in Division 11 and Fylde Surfers 5th in Division 15. All of our teams did brilliantly. We met our European neighbours from Germany and Belgium and what great racing they gave us. 2007 was the start also of the Fylde Coasters puppy boom with Tia and Tasha the Boxers, Dillon the Border Collie, Nushka the Australian Shepherd, Jethro the Sprocker, Mika the Jack Russell, Bobby the Cocker and Esky the Australian Shepherd Working Sheepdog cross. That’s how many puppies! I feel that there will be fun in starters in 2008 and possibly a ready-made Multibreed team! 2008 saw maturing of the puppy boom for the Fylde Coasters with us having 2 starter teams, the aptly named Fylde Babies and Fylde Hot Dogs. We altered our training to accommodate our 2 teams of pups and once old enough to race we saw our training pay off with most pups competing in sanctioned competitions during August and September 2008. The season saw all our teams seed times improve with the Fylde Coasters gaining there fastest ever recorded time of 18.79. 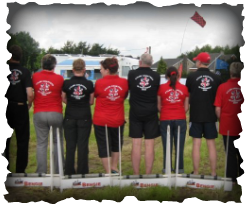 The Summer Championships in Warwick were the best we have ever been to. With a superb venue, excellent racing and a fantastic atmosphere both in and out of the ring. Our 3 teams did us proud with the Coasters coming 3rd; Surfers 4th and the Piers winning the Division and the 1st Place team consisted of Boogie, Jet, TJ, Pepsi, Maddy and Mika. The evening’s entertainment and huge gazebo with space hopping flyball and a disco went down a treat. 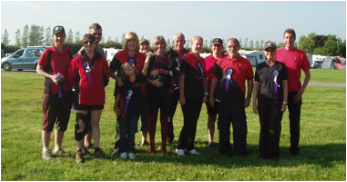 Our 4 Multibreed teams scooped many 1st places along with the Fylde Pick ‘N’ Mix winning the prestigious Tudor Rose Multibreed 2008 Trophy. 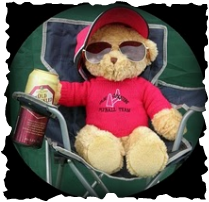 A huge thank you to all my team for superb racing and many enjoyable weekends away. 2009 saw many of the Coaster's cross the channel into mainland Europe to compete in the European Champions. Back in England at the BFA championships, the Fylde Piers came 2nd in Division 31, The Fylde Surfers propped up Division 23, the Fylde Rollercoasters won Division 18 and the Fylde Coasters won Division 9! At the end of the year some members left the team and went on to form Ready2Fly. The Fylde Piers won Div 41, making them the fastest slowest team in the country! The Fylde Surfers won Division 24 and the Rollercoasters came 2nd in Div 12. To top it all off, Fylde Pic n Mix took home the annual Tudor Rose award as the most successful Multibreed team in the competition. All gained in 2010. In 2011 Rollercoasters won Division 33, The Coasters won Division 16 and the Surfers came 3rd in Division 23. Almost a year of 3rds!! The Fylde Gunners (a team of gundog breeds) game 3rd in Division 41, The Piers came 3rd in Div 44 and the Rollercoasters came 3rd in Division 23. However, the Fylde Coaster's took home 1st place in Div 9 by the length of a grey hounds nose. In 2012 almost a year of 3rds!! The Fylde Gunners (a team of gundog breeds) game 3rd in Division 41, The Piers came 3rd in Div 44 and the Rollercoasters came 3rd in Division 23. However, the Fylde Coaster's took home 1st place in Div 9 by the length of a grey hounds nose!